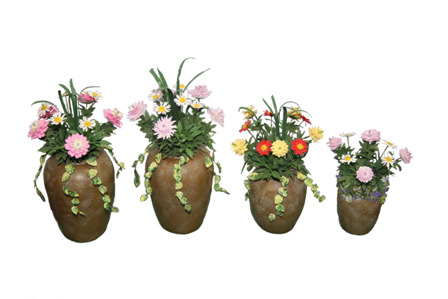 These stunning patio jar planters were designed by IGMA Artisan, Judy Travis of Mini Creations by Judy exclusively available through DMMA member shops. They are available in several colors and 3 sizes. Stunning, aren't they? This modern living room is available as a set, or individual pieces, but only through DMMA member shops. Lee's Line designed the fresh blue and yellow pieces with an eye to current styles and sizes. Mix and match, or buy the set. Go to our "Member Shops" listing to find the store nearest you. 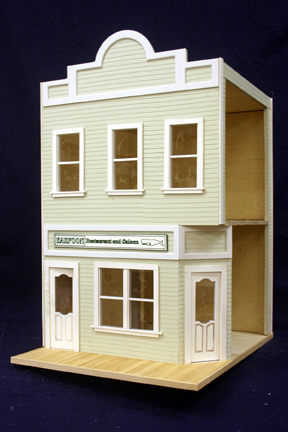 This assembled cottage from Alessio Miniatures is only available through DMMA member shops and includes windows, door, staircase, handrail, foyer and tower. It has a brick exterior, painted cream. It measures 18" w. x 20" h. x 15 1/4" D., plus foyer depth.